What is the Dress Code at Buckeye Girls State? Can I arrive late to Buckeye Girls State? Can I leave Buckeye Girls State early? How are Buckeye Girls State Delegates chosen? When and where are Orientations scheduled this year? I am a Buckeye Girls State Alternate, am I supposed to take the On-line Orientation? Can I drive myself to Buckeye Girls State? How much money should I bring to Buckeye Girls State? Can I bring my cell phone to Buckeye Girls State? Are there snacks available between meals at Buckeye Girls State? Can you give me directions on how to get to the University of Mount Union? No, you must arrive between 1:00 and 3:00 pm on Sunday, June 12th for registration. Key activities begin immediately after registration and missing these activities will negatively impact what a delegate gains from the program. If you find that you cannot arrive on time, contact your sponsoring American Legion Auxiliary Unit so they may notify the alternate. 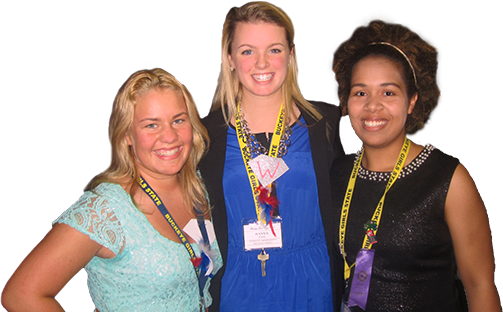 Buckeye Girls State has a policy that all delegates must stay for the entire program, which lasts seven days. If a delegate leaves early she forfeits all rights to any honors, awards and scholarships which are presented or announced at the closing program. She is not permitted to say that she attended the program. Unlike a camp, Buckeye Girls State is a week long process for learning about government, campaigning and running for office and then operating in the elected or appointed position for the rest of the week. And it's not fair to other citizens who are counting on her to perform those responsibilities throughout the week. If she leaves the program early she will not get the full benefit of participating. We recognize this is a difficult decision for young women. But this is just one of the decisions she will be making as an adult and only one of the life lessons she may learn by attending Buckeye Girls State. If a delegate elects not to attend, please contact the American Legion Auxiliary Unit sponsoring her so that they can notify the alternate. Candidates for Buckeye Girls State are chosen in a selection and interview process conducted by the local American Legion Auxiliary Unit in your community. The process can extend from December to May depending on the local Unit's specific schedule. Good news! You will not have to travel anywhere for an Orientation this year except to the nearest Internet ready computer. The Orientations are being administered on the BGS Website www.buckeyegirlsstate.org beginning in mid-April 2016. The Delegate Packet you will receive in mid-April will contain specific instructions about how you log on to take the Orientation program. Be sure you have thoroughly studied the contents of the Delegate Packet before attempting the Orientation as the questions asked pertain directly to the information contained in the packet. No, an Alternate is not required to take the On-line Orientation unless she becomes a Delegate in the future. However, it is recommended that all Alternates complete the On-Line Orientation then she will be ready to replace a Delegate if necessary. Then if a change is made and notification of the change has been made to this office, she will be sent a Delegate Information Packet. In the meantime, Alternates are encouraged to review the on-line version of the Delegate Packet found on this website. Each Delegate is responsible for her own transportation to and from Buckeye Girls State. In the past, Delegates were primarily accompanied by their parents. Remember that if you drive your own car, you must turn in your car keys to the Information Center in the Kolenbrander-Harter Information Center (Library) Room 013 upon your arrival. Page A-6 of the Delegate Information Booklet lists the cost of some of the items available for purchase while you are at BGS. We do not advise a particular amount of money to bring because that is such an individual decision. And remember ATMs are available for your use on campus. You are welcome to bring a cell phone to BGS but remember, the use of cell phones during assemblies and government functioning periods is strictly prohibited. Most residence halls on the campus of the University of Mount Union have snack and soft drink machines in the lobby. Complete written instructions and a map are contained in your Delegate Information Packet. No matter what corner of the state you are coming from these instructions will get you easily to the UMU campus.